What does error 4013 mean on iTunes? When you are upgrading or backing up your iPhone to the latest iOS version via iTunes, a prompt jumps out and tells you that your iPhone could be restored and an unknown error occurred, which is right known as “iTunes error 4013″. Simply speaking, it is a bug in iOS devices. Now you know the question “What is error 4013 on iTunes”, do you know how to fix iTunes error 4013? This article will introduce why iTunes error code 4013 occurs and how to carry out iTunes error 4013 fix. Many of us may encounter iTunes error 4013 on our iPhone and it prevents iOS devices functioning normally, which is quite annoying for us. What kinds of reasons attribute to “iTunes error code 4013″? 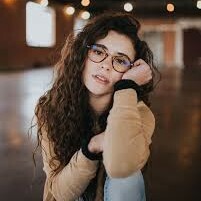 Here you can take a look. 1. Your iTunes is not the latest version. Sometimes, if you don’t have the latest version, it will result in “iTunes unknown error 4013″. To implement iTunes error 4013 fix, you can update your iTunes to the latest version by going to “Help > Check for Updates” in iTunes and then check if the situation is improved. 2. Your iPhone is in low battery. Low battery can cause error code 4013 iTunes. Remember to charge up before backing up iPhone data to iTunes. 3. Improper Wi-Fi connection. If your Wi-Fi is poorly connected, the update or backup will be stopped and you will get the message of iTunes error code 4013. You can restart Wi-Fi or connect to another Wi-Fi to do iTunes error 4013 fix. 4. Your USB porter or connector doesn’t work well. The unstable connection to your computer will lead to iTunes unknown error 4013. You can try another USB porter or connector to fix this issue. 5. Your iPhone has no enough space. It is definitely possible that “error code 4013 iTunes” arises from insufficient space on iPhone. Hence, you can clean up or release your space by removing some unwanted files or apps. I believe no one would like to be taken by this kind of surprise – error code 4013 iTunes. To ensure the safety of iTunes library, we suppose to backup iTunes library to computer. How to copy iTunes library to computer? I think you might want a small favor from Leawo iTransfer. Leawo iTransfer is regarded as the most terrific transferring tool to realize file transferring between iTunes, different iOS devices and PCs. You can back up any kinds of information like TV shows, apps, music, contacts, bookmarks and so forth from iPhone, iPad, iPod to iTunes library and also backup iTunes library to computer. Leawo iTransfer can be free downloaded and enjoys the trail version to enable users to free transfer items. If you feel it is easy and efficient to use, you can pay $29.95 to have a lifetime use. Now the guidance will show you how to copy iTunes library to computer via Leawo iTransfer. Plug your iPhone to computer and run Leawo iTransfer after downloading and installing it. 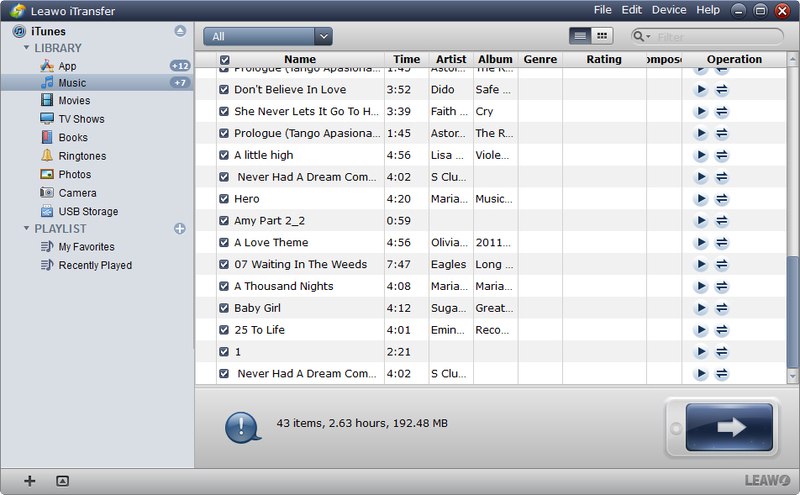 The software will automatically detect iPhone device and shows iPhone library and iTunes library in the left sidebar. Each library has different categories. In the right interface, you can see the capacity, type, serial number of iPhone. Click on the name of “iTunes > LIBRARY”, different categories are listed under iTunes library. Here we take music transferring for example. 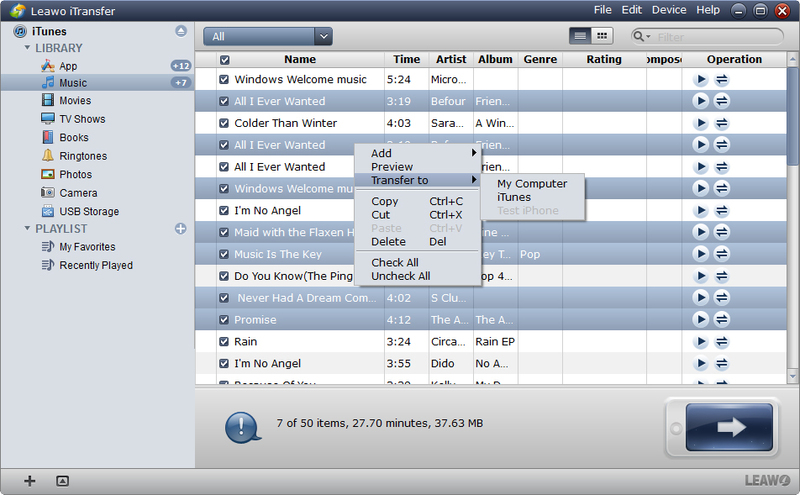 Choose “Music” to have an overview of music on iTunes library in the right interface. Check the square before “Name” to select all songs. After that, you can right click them to choose “Transfer Now > My Computer” or click on the transferring icon in the downside right corner. Check “Save to folder” and click “Change” to browse a target folder on your computer in a pop-up dialogue. 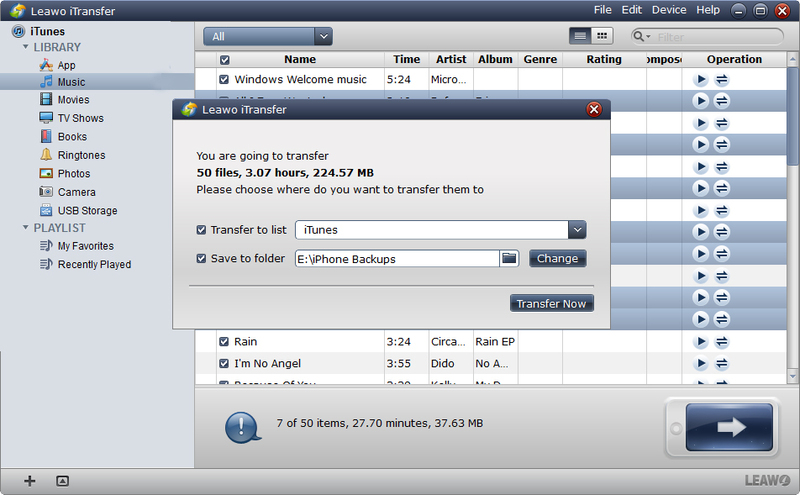 After you confirm which folder on your computer you would like to transfer, click “Transfer Now” to transfer iTunes music to your computer. A progress bar will indicate the transferring process. Be patient and you will get iTunes music on your computer in a minute. Since iTunes library has other kinds of contents, you still need to head to each category by following the similar steps listed above to copy the whole iTunes library to your computer. In short, what you need to do is choose one category, select all items under the category and transfer them to specific folder on your computer. Leawo iTransfer is concise and modern in the interface design and I believe you can easily learn how to transfer iTunes library to computer. Don’t hesitate to download and install Leawo iTransfer, you will find an easier and more convenient world.